Today, the drinks are on me because it's the beginning of my summer vacation! If you've been following my blog over the last few weeks you'll know that I've been anticipating this day for quite some time. The drinks are also on me, literally, because this pink top from Target has little tiny tropical drinks all over it! While I love cocktails, I'm not huge fan of fruity, tropical drinks, but they are pretty to look at and even prettier on this top! Plus, who am I kidding, I'll drink just about anything, especially now that I can kick up my feet and relax for a while! I ordered this top online, as it wasn't available at my local Target. When the top arrived, it was already tied in a cute little bow so I decided to keep that look for this outfit. 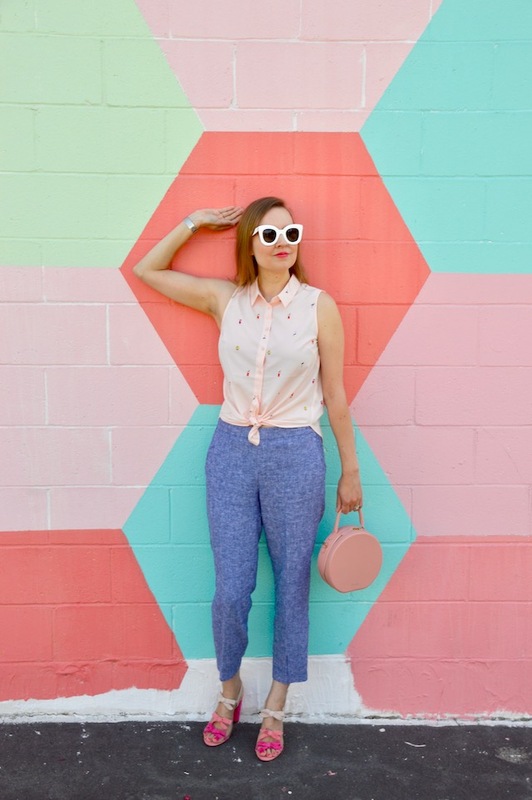 I also paired the top with these incredibly comfortable linen-blend pants. Be forewarned, however, as these pants are quite deceptive; they look like they have a zipper and a fly but they are really just pull-on pants with elastic in the back of the waistband. It's actually a very pleasant surprise, as I think they just might be my favorite pants that I've purchased in quite a long time. They would definitely work for sipping tropical drinks poolside and I suppose I just might have to try that this summer! 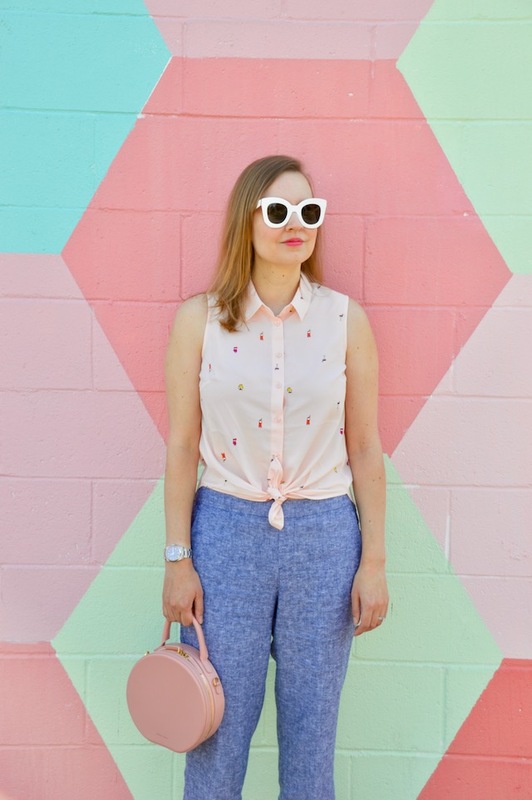 This top is perfect for summer! 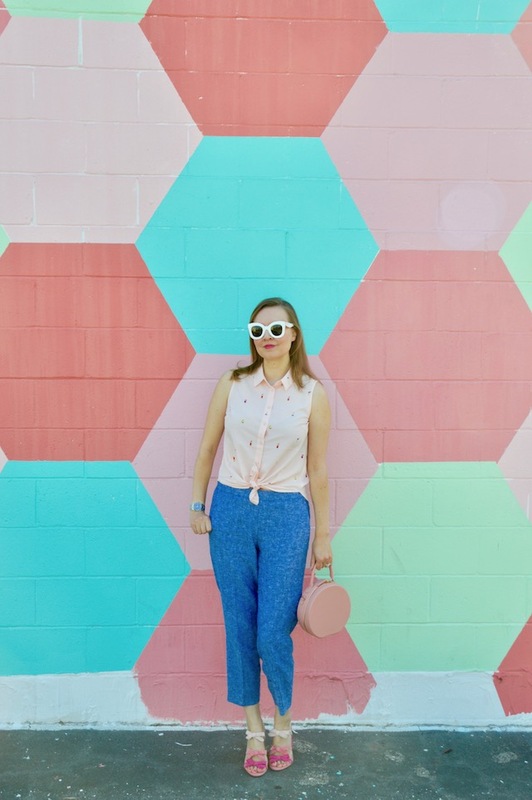 I love all the colors in these pictures, that wall you found is so fun and perfect! Very nice top and gorgeous sandals!